Natural gas is the choice of chefs across the food service industry for delivering fast, precise and powerful heat. Plus, the Texas Gas Service Energy Efficiency Program. 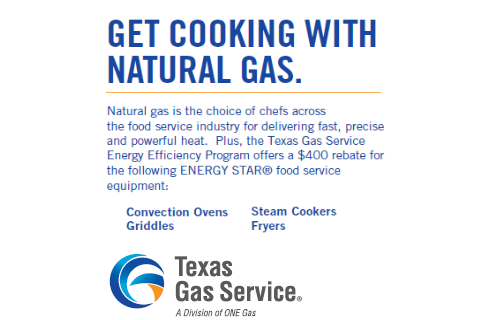 The Texas Gas Service Energy Efficiency Program offers a $400 rebate for the following ENERGY STAR® food service equipment: convection ovens, griddles, steam cookers and fryers. Rebates are available to eligible Commercial Rate customers in the Central Texas and Rio Grande Valley service areas, living inside city limits. For a complete list of rebates, terms, eligibility requirement, forms and natural gas fact, visit TexasGasService.com/Rebates.